Unfortunately, a computer network is not something that can simply be installed and then forgotten about. Just as a regularly serviced car will return a greater level of reliability and lower running costs to its owner, a computer network that is well maintained, regularly monitored and serviced, will do the same. Frequently businesses, particularly those with no on-site IT expertise, make an initial, often significant, investment in an IT solution and realise immediate productivity gains,­ assuming the solution was done right. As time goes on, performance begins to suffer and the business’ once-reliable system starts to become unreliable, and the cycle repeats. This all too common approach invariably results in a significantly higher total cost of ownership and reduced productivity for the business. In addition to prolonging the life of your IT investment, regular monitoring and maintenance will also identify and prevent potential problems evolving into real problems, disrupting your business. For example, identifying storage issues before your key business applications grind to a halt due to lack of storage space. 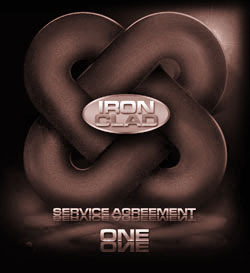 Recognising that for many businesses, managing their IT environment effectively is often a challenge and seldom a priority, Big Iron have created a comprehensive IT Management and Service Level Agreement called IronClad-1. IronClad-1 is specifically tailored to small to medium-sized New Zealand businesses that need dependable IT systems without having to rely on in-house expertise. It provides a cost-effective, quality solution that offers you peace of mind, giving you the freedom to concentrate on running your business without having to worry about managing and supporting your IT systems.